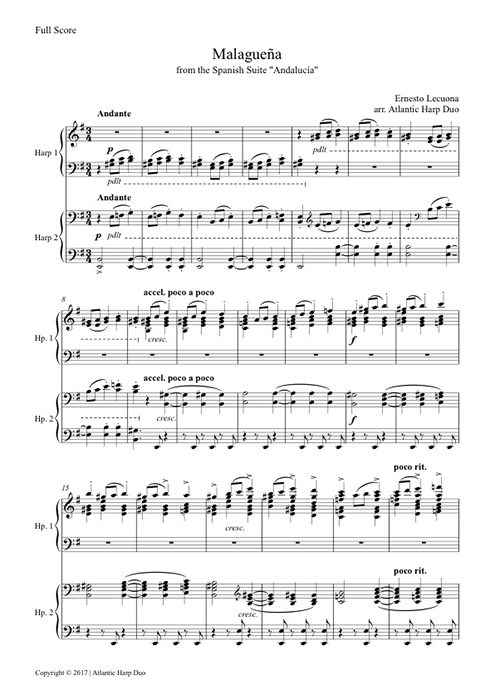 All publications by the Atlantic Harp Duo include a full score as well as individual parts. Scores are distributed as high-quality PDFs, and each one has been carefully formatted and edited for maximum clarity. 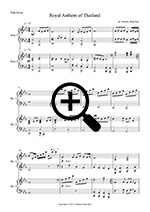 There is also special attention given to page turns for the individual parts. Each Atlantic Harp Duo arrangement is based closely on the original work and captures the core spirit of the composer’s intentions. When ordering, you may select to receive either an unmarked version of the piece or a version with pedal markings in the parts (the full score is unmarked in either case). Atlantic Harp Duo pedal markings adhere to a rigorous system of standards: They are notated using letters (e.g. C#, Db, etc. ); The right-foot pedals are notated consistently above the left-foot pedals; All pedals are marked under the staff. All pedal markings and page turns have been tested in performance by the Atlantic Harp Duo. 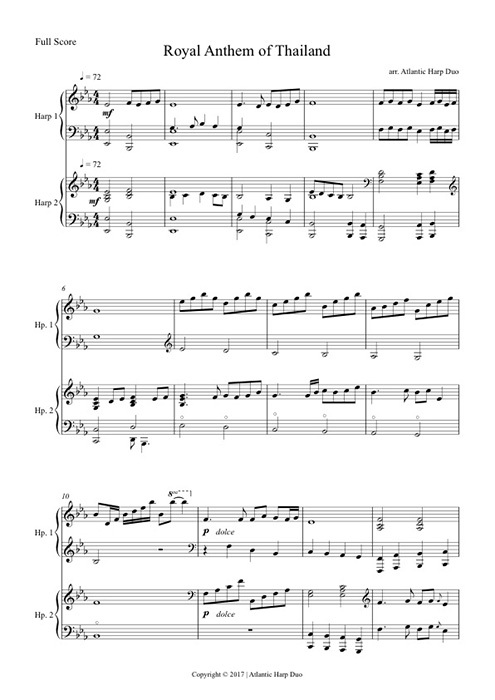 This set is the first prelude and fugue from J. S. Bach’s Well Tempered Clavier, book II, originally for piano. The score for two harps covers ten pages, while the parts for harp 1 and harp 2 are each four pages long. 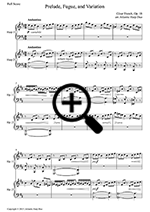 Performance notes for ornamentation are also included. The total performance duration is approximately 4:30. 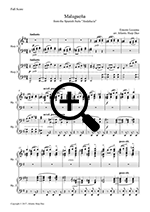 F. Chopin – Polonaise, Op. posth. Originally for piano, this Polonaise is a virtuosic and stylized rendition of a traditional dance from Chopin’s native country, Poland. Written early on in the composer’s career, this piece was only published after his death. The score for two harps consists of seven pages. In addition, harp 1 is four pages, and harp 2 is three pages. Performance time without repeats is approximately 4:20. 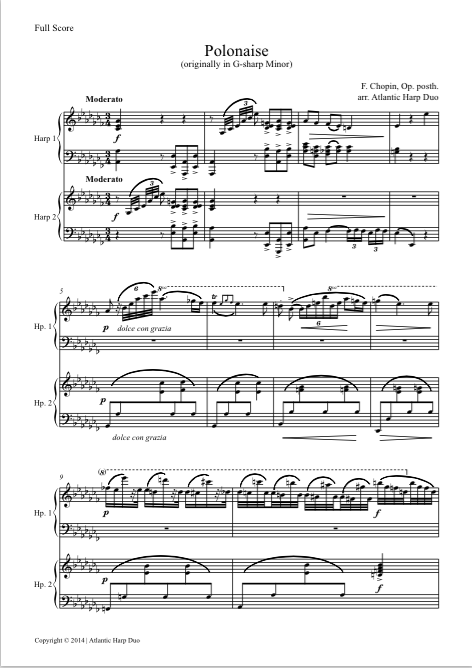 This prelude paints a vivid picture of the rain storms on the Spanish island of Mallorca, where Chopin stayed for several months in 1838 to escape the cold Parisian winter and nurse his onsetting consumption. The score for two harps is three pages long, and the parts for harp 1 and harp 2 are each two pages. The duration of the piece in performance is about 4:40. 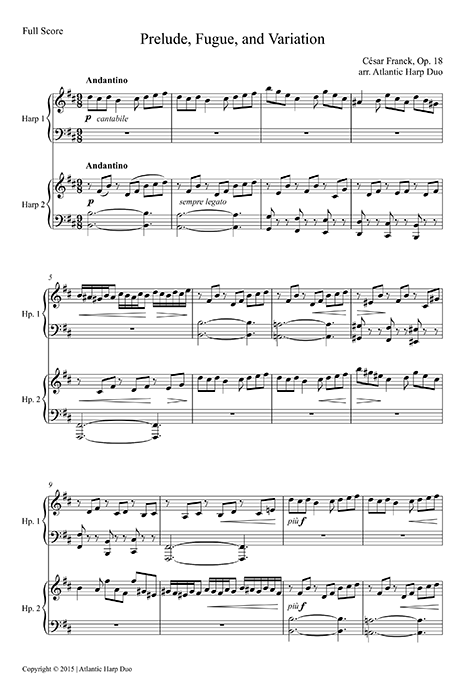 Franck originally composed this masterpiece for solo organ and then later made an arrangement for organ and piano. This scholarly adaption for two harps draws from both these versions and stays true to the original voicing and harmonies. The full score for two harps covers 18 pages, harp 1 is 8 pages long, and harp 2 is 7 pages. The total performance time of the piece comes to 8:45. Featured on the Atlantic Harp Duo’s album Rhythms of Spain, Ernesto Lecuona’s “Malagueña” starts out with deliberate restraint before gradually working up to a fiery tempo. This arrangement for harp duo falls comfortably in the hands of the advanced harpist. 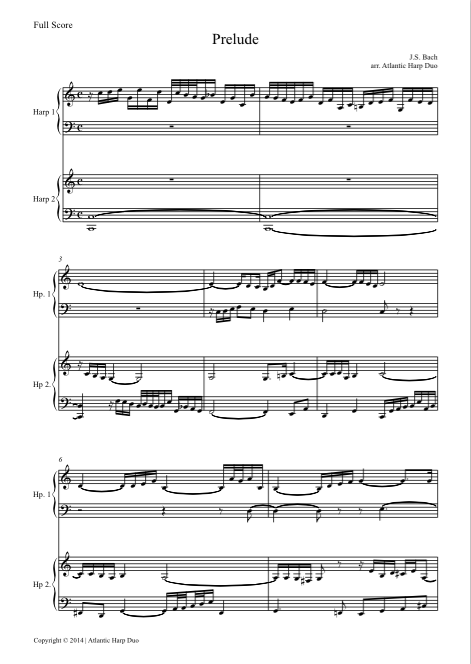 The full score for two harps is 9 pages, harp 1 is 5 pages long, and harp 2 is 4 pages. The total performance time of the piece is about 4:20. The Atlantic Harp Duo arranged this iconic Thai anthem in 2011 for a benefit concert to support flood victims in Thailand, where Elizabeth was living at the time. This ceremonial piece is regularly heard in Thailand, to honor the presence of members of the royal family, as well as at the commencement of all public shows in concert halls, theaters, and cinemas. 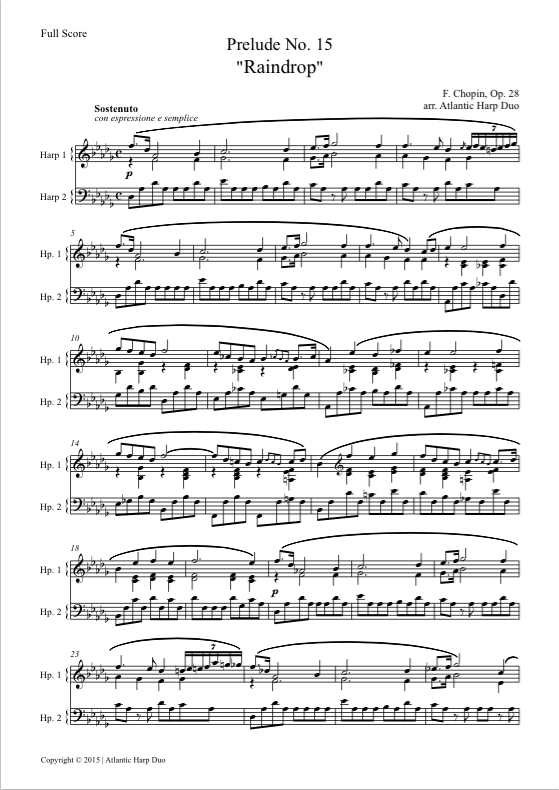 The full score for two harps is 2 pages, and each part is just 1 page. The total performance time of the piece is 1:30. This score has not yet been finalized for publication. 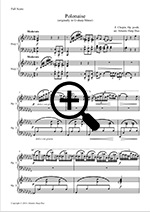 If you are interested in purchasing this score, please let us know by clicking the button on the right. We will give this piece higher priority and send you an e-mail when it is ready.